This article will present both companies (to help a better idea of the business of these), the need and approach to deal with the subject and finally, the solutions and designs offered by the provider. Let’s dig in this interesting and rewarding study case. Built on a philosophy of talented people and great results, QPSOFTWARE LTD is a results-driven, web design agency based in Shanghai specializing in website design, WeChat & Mobile app development and digital marketing. Since their establishment in 2007, their mission has always been to create websites and digital solutions to help their clients grow their businesses online. Indeed, the QPSOFTWARE difference is built on relationships with measurable results as they take pride in nurturing authentic connections between their partners/clients and their intended audience. QPSOFTWARE celebrates more than a decade of digital expertise with high profile brands such as: LOUIS VUITTON MOET HENNESSY, AIR FRANCE – KLM, BOSCH, AUCHAN, SCHNEIDER ELECTRIC and PEUGEOT, just to name a few. As an overview, SWATCH Group looks to QPSOFTWARE to create a social media strategy campaign that includes social polling/social surveys, by creating visual content that grabs the brand’s audience in order to deliver a more engaging social experience with useful analytics. To understand which social media channels are most effective for reaching SWATCH’s market segment to include polling/surveys in its social media strategy, they first need to explore how its audience use social media. Indeed, the networks that evolve on social media platforms like Facebook, WeChat, Twitter, Instagram, YouTube, and others; might include the very audiences SWATCH as a business serves. But for this specific case let’s focus on the polls and surveys. They are some of the most powerful tools brands like SWATCH can incorporate into their social strategy. Indeed, an effective social campaign should include different ways to interact with SWATCH’s customers and prospects, such as engaging SWATCH’s user base that has already demonstrated its interest by “liking” or “following” SWATCH’s page on its different social channels. Social polling and online surveys would give SWATCH’s followers the opportunity to get involved, as well as give the Swiss brand feedback on existing products or planned product feature releases. Facebook now enables you to create and post opinion polls on your Facebook timeline so that brands can effectively collect and monitor the social feedback from their followers. SWATCH can take advantage of the Twitter polling features as it gives brands a unique opportunity to find out what their audience likes by simply asking - and on a mass level since SWATCH has over 43k twitter followers. Not only Twitter polls will help SWATCH conduct market research by collecting data and sentiment from its audience, but it will also involve its audience in the decision-making process by asking them which Santa Watch they would like Swiss watch maker to produce. Given the insane growth of Instagram and the number of followers, SWATCH has on the platform (+700k), designing and hosting an Instagram voting contest to engage with the brand’s audience is crucial. Since there are no polling/survey tools already integrated within the app, and since Instagram is built on hashtags, SWATCH can use a combination of hashtags, likes and vote to create regular contests for users, thus generating tremendous results. Indeed, SWATCH can ask its audience to like the posted pictures/videos and comment by typing in the hashtags associated with the products the brand is willing to get feedback on. Voting contests based on hashtags are a perfect way to type into the viral nature of social media. Actually, Hashtags on Instagram function like keywords for SEO. The hashtags with the most engagement are like keywords that bring in the most traffic. As the most active social media platform in China (900 million active users), WeChat is an indispensable tool with a wide range of commercial functions used to do all kinds of business transactions, which companies deploy to help their business grow. Within this context, and knowing that SWATCH already has a public account, QPSOFTWARE can leverage the Wechat API, adding more useful functions to it for WeChat public account users as it synchronizes with the brand’s public WeChat account, thus allowing it to draw data from SWATCH’s WeChat account. Doing so will make the WeChat survey creation process easy and efficient. Using this API, SWATCH’s account can send its users push notifications once people take the WeChat survey, and easily keep track of the results. On the back-end side, a very comprehensive dashboard enables you to see the evolution of results over time and easily makes sense of the data you received. Also, the platform also enables brands to organize lucky draws, incentivizing users to participate, interact, and follow the brand’s WeChat account. QPSOFTWARE believes it is the best choice for companies such as SWATCH needing an efficient solution with good design and comprehensive data analysis. What can QPSOFTWARE do to help them? It was hard to imagine a time when red and green were not synonymous with Christmas, but they have not always been the holiday's go-to colors. Indeed, with a non-traditional Santa Claus in town, QPSOFTWARE's team of designers decided to look into bright, punchy, and vintage colors for this project. While they may have used a lot of colors all at once, they still kept it cohesive and logical with the warm and fun consistency of the whole scheme. As stated previously, the global social sentiment for SWATCH is positive, which makes SWATCH’s brand Identity perceived as a young and fun company. Therefore, they combined colors that have a high contrast against each other to make for a clean effect and a very welcoming palette. 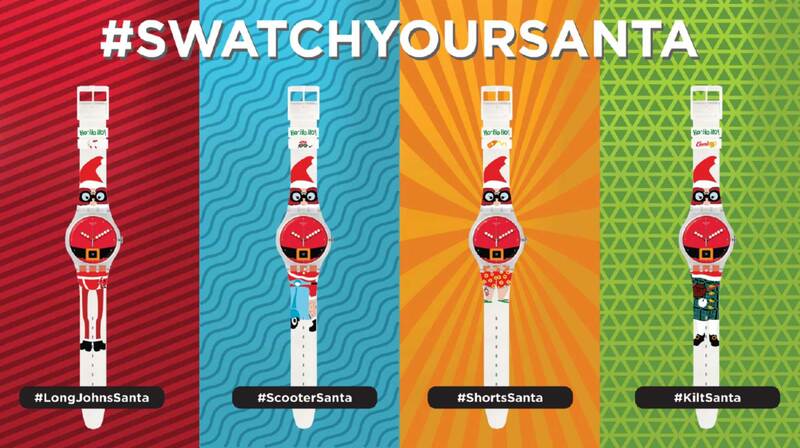 The #SWATCHYOURSANTA hashtag was used as the main campaign slogan. Indeed, they believe it totally matches the featured products, as it does also resonate with the targeted audience and brand identity. With video advertising quickly becoming the most effective way to reach captive audiences, especially on dynamic platforms like Twitter, Instagram, Facebook, Youtube and WeChat, their design team decided to follow the mobile video consumption trend to engage SWATCH’s audience with a short frame by frame video. Indeed, as the viewers’ attention span is short, QPSOFTWARE strongly recommends using short videos (under 2 minutes) with engaging graphic overlays. Therefore, you can tell they got their inspiration for the video from the French duo Daft Punk’s “Technologic” hit single that was released back in 2005, in which electronically transposed voice chants technological commands (for example, "Plug it, play it, burn it, rip it, drag it, drop it, zip, unzip it"). Each of the selected wording represents a different part of the featured product and the voting process. Also, each of these individual words of text can be used as engaging hashtags throughout the whole social polling campaign as well as the bits of videos associated with them. Indeed, the video can be cut and exported into different bits of gifs and be used as means to further enhance visual content engagement and reach. As you can see, SWATCH Group had a project / a need to be able to find a way to find what product would be the most popular to sell for the coming Christmas. The main point that QPSOFTWARE proposed them was to use the polls and survey that each social media or platform could offer them. Indeed, they have a huge number of followers on all of them and they need to capitalize on it. Information is power, so use it wisely! If you have some help to launch that kind of project or even other related to the digital marketing/world do not hesitate to contact QPSOFTWARE will be glad to help you: contact@qpsoftware.fr or click here.